Crusade Clothing sent me this gorgeous playsuit a while back but the weather was never nice enough to wear it out in the day so my holiday was the perfect opportunity to get some wear out of it. 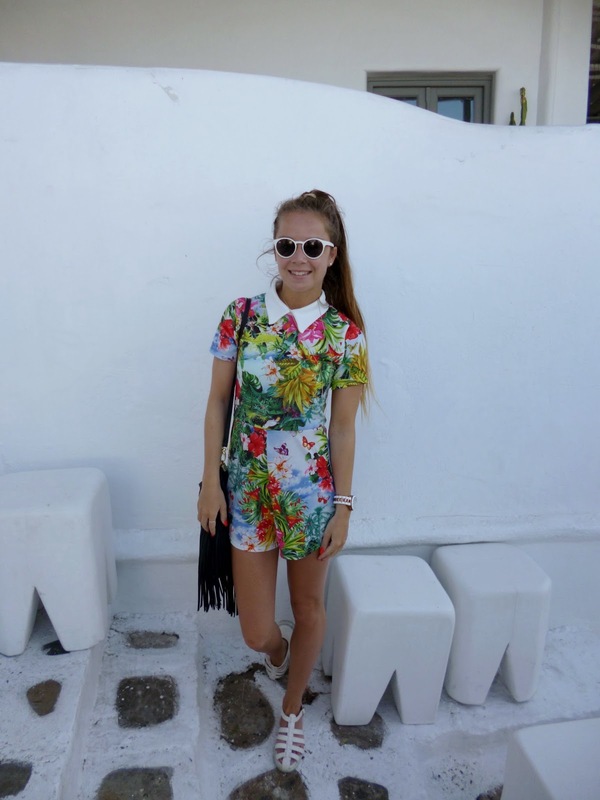 The playsuit is a little out of my comfort zone with the bright pattern but i actually really like it,the material is so lightweight so i still kept cool in it despite the boiling hot weather in Mykonos. I teamed it with my matching white glasses and sandals to let my playsuit take centre stage! Mykonos was my favourite port of call on my holiday (blog post to follow soon!) and again like Santorini the perfect white backgrounds were the perfect back drops for outfit photos! Crusade Clothing don’t stock this playsuit anymore but there are lots of other affordable pieces on their site. What do you think of this playsuit? Is it something you would wear? Have you shopped with Crusade Clothing before? Previous Post Lush Plymouth blogger event!